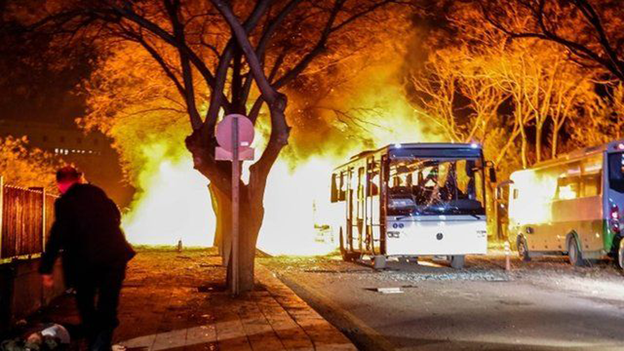 Eyewitness Natalie Galley: "I heard a huge explosion"
A large explosion in the Turkish capital, Ankara, has left at least 28 people dead and 61 injured, Turkish officials have said. 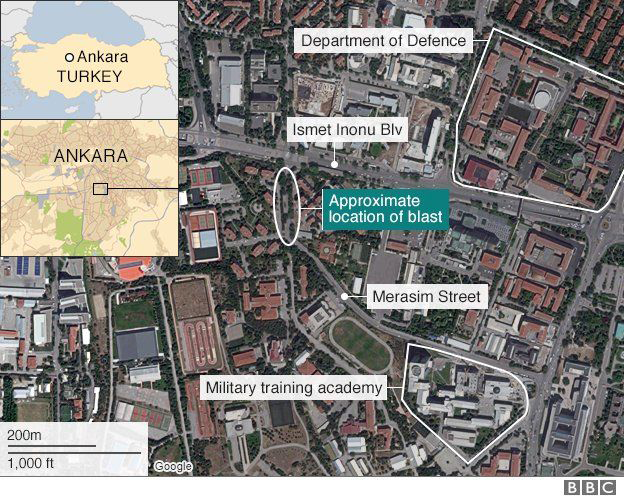 The blast happened in an area close to parliament and Turkey's military headquarters. Deputy Prime Minister Bekir Bozdag called an "act of terrorism". Large plumes of smoke were seen rising from the area and witnesses said the blast was heard all over the city. Some of the victims were civilians. Ambulances and fire engines were sent to the scene. Security forces carried out a controlled explosion on a suspect package after the blast. Turkey's Prime Minister, Ahmet Davutoglu, has cancelled a trip to Brussels. Turkey has been hit by a serious of attacks recently, and there have been increasing concerns that the country could be targeted by another big attack, the BBC's Selin Girit in Istanbul reports. President Recep Tayipp Erdogan said Turkey was more determined than ever to use "its right to self-defence". In a statement released several hours after the attack, he said: "Our determination to respond in kind to attacks taking place inside and outside our borders is getting stronger with such acts." "Enough is enough! Do not kill any more! Do not make the people of this country sad anymore…"
Just one tweet summarising the dark mood across Turkey. Hundreds of people have been offering their condolences to the relatives of the dead, condemning the attack, posting pictures and videos of the aftermath of the scene on social media. The attack targeted a shuttle bus carrying military personnel, and there were several other military vehicles nearby - all of which were waiting at the traffic lights. Most of the casualties are believed to be soldiers. The Turkish army strongly condemned the attack and called this "a treacherous terror act". The government and the opposition parties have also strongly condemned the incident. In October, over a hundred people were killed in simultaneous explosions targeting a peace march in Ankara. That attack had polarised society further. Whether Turkey can unify in pain this time round is yet to be seen. It is not clear who was behind the latest violence; security sources blamed both so-called Islamic State (IS) and militants from the banned Kurdistan Workers Party (PKK), Reuters reported. A government spokesman said the attack had been well planned. The PKK has been fighting for autonomy for Turkey's Kurdish minority for decades and has carried out regular attacks on Turkish security forces. The blast in Ankara comes as Turkey steps up its involvement in the conflict in neighbouring Syria. It has been shelling the Kurdish YPG militia in northern Syria, who it sees as allied to the PKK. Turkey has also allowed the coalition bombing IS to use one of its air bases.